Louisville, KY (December 5, 2014) – Recognized for its outstanding programming and for having a positive impact on both the community and its membership, Butler County Farm Bureau was honored as Kentucky Farm Bureau’s (KFB) “Top County” in 2014. This is the second year in a row that Butler County won the award. Volunteer leaders from Butler County received the award at a recognition breakfast held this morning during the 95th KFB annual meeting at the Galt House Hotel in Louisville. 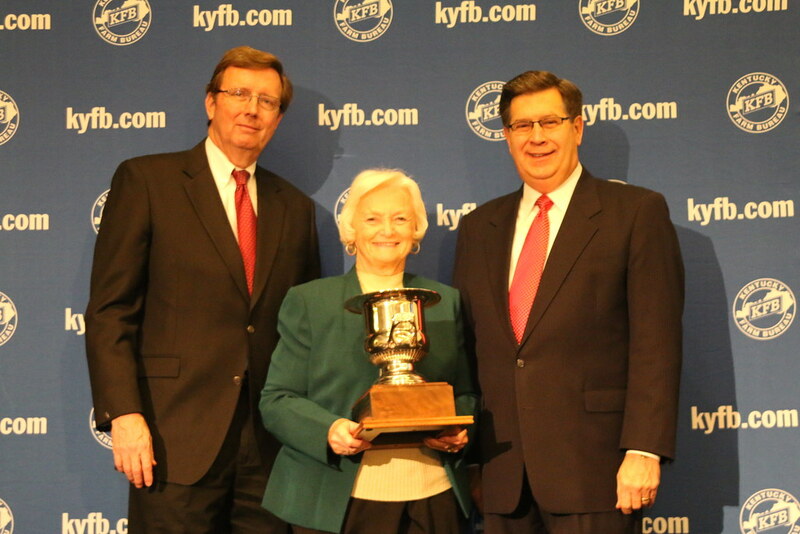 Betty Farris, President of Butler County Farm Bureau (center), accepts the “Top County” award from David S. Beck, KFB Executive Vice President (right), and Bradley R. Smith, KFB Insurance Companies Chief Executive Officer (left). The “Top County” announcement headlined more than 111 membership program and insurance honors presented during an awards breakfast this morning. Butler County, which has 2,131 members and a variety of successful service programs, was also honored as the Top County in the membership category for counties with 2,600 or fewer members. Bath County (2,820 members) received recognition among the counties with 2,601 to 4,200 members, and Hardin County (11,445 members) won top honors among counties with more than 4,200 members. Outstanding County Farm Bureaus were designated in 11 of Kentucky Farm Bureau’s 11 districts. The recipients were: Bath, Barren, Breathitt, Boone, Butler, Hopkins, Madison, Robertson, Russell, Shelby and Trigg Counties. McCreary, Lewis and Warren Counties received Top Growth Awards for having the largest percentage of membership gain from 2013. Pacesetter Awards were given to counties in the three membership size classifications that were the first to achieve a membership gain during the year. The large county award went to Warren County, followed in size by Breckinridge and McCreary Counties. 11 counties won honors for having the highest member retention totals in their districts. Those winners were: Barren, Breathitt, Breckinridge, Campbell, Cumberland, Floyd, Lee, Lewis McCracken, Spencer and Webster Counties. Wayne County was honored for having 51 consecutive years of membership growth. Washington County was recognized as the Most Improved County Farm Bureau. Three awards were given for most effective county Farm Bureau information programs. Mercer County won first place, Union County was second and Logan County was third. 110 counties won awards for policy growth and profitability produced by their local Farm Bureau insurance agencies. Caldwell, Carroll, Clark, Grayson, Greenup and Harrison Counties came closest to the growth goal set for that county. Kentucky Farm Bureau, with more than 465,000 member families statewide, is the state’s largest general farm organization. Approximately 1,500 members attended KFB’s 95th annual meeting in Louisville, December 3-6, to recognize this year’s individual and organizational achievements and adopt policy for 2015. Cutline: Leaders of Butler County Farm Bureau accept the “Top County” award from David S. Beck, KFB Executive Vice President, and Bradley R. Smith, KFB Insurance Companies Chief Executive Officer.